Dear PPH Sellers, We have an exciting new feature! In a knowledge-driven economy, the biggest winners are always those that can demonstrate a particular ability, specialisation or skill. Being a jack of all trades (and a master of none) won’t take you far in your career. But you already know that! Inspired by your feedback, we have changed how profiles are featured to allow Sellers to bid on and feature their individual skills. Sounds good? Then let’s get into the nitty-gritty. With this new feature, you can now feature just one or several skills of your choice. What it means is that you have complete control of the types of leads you’re generating. If you’re happy to take on any project and have a strong portfolio and reputation on the site, you might want to go with several different Featured Skills. If you’re after a particular type of work, say logo design, then it would make sense for you to feature just one individual skill that would get that message across and attract the right Buyers. It’s an auction-based bidding. Only the top 3 highest bidders for each skill will get featured every day and those who bid unsuccessfully (don’t get featured in the top three) won’t be charged. Additionally, Sellers who bid the most money across all skills will appear as Featured on the freelancer listing page. How can you bid on your individual skills? 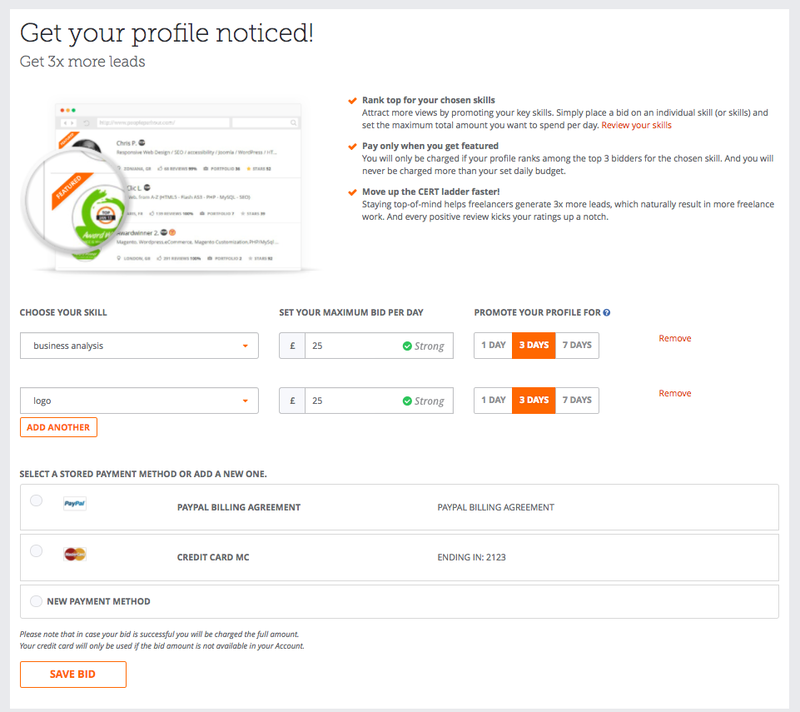 Click on “Feature profile” in your seller dashboard. In the “Choose your skill” section, select one of your approved skills from the drop-down menu. Then enter the maximum daily budget you want to spend and choose the preferred period of promotion from 1, 3 or 7 days. If you want to bid on more than one skill, click on “Add Another”, then add another skill and follow the same steps. Please note you can’t feature the same skill more than once. Once everything’s setup, select your preferred method of payment and save the bid. You will only be charged if your bid gets into the top 3 bids and your skill is featured on that specific day. How will you know if your bid was accepted? You will receive an email notifying you whether your bid was successful or not. At the end of each day, the system will check which of the Sellers had the highest bids for every skill and notify everyone automatically. If you select a longer promotion period (3 or 7 days), the system will go through the same checks every day and automatically place your bid for the chosen skills. This means you might have your skill featured on day 4 and 5 out of the 7-day period, for example. In such case, you will only be charged for two days. Featuring individual skills is an effective way to capitalise on your top skills, build (or expand) your portfolio and move up the CERT ladder faster. Have a go at this new feature and share your feedback in the comment section below. Thank you for the new feature! Is this new ? Ive been using this for at least a couple of months with mixed results tbh. This is not a feature that helps freelancers really. For example, I would like to feature my profile for Google Adwords Specialist area. But, this skill could be entered as PPC, Google Adwords, Pay Per Click, Search Advertising, so on and so forth. To be able to cover so many different variations of the same skill, a freelancer would have to shell out a lot of money because PPH would see them as all different skills, which is hardly fair. The search stats have massively dropped too ever since this feature was rolled out. Good Features, thanks for update. How about fixing your search so it shows relevant freelancers/hourlies? Thank you PPH, sounds interesting! Its a good positive way to present this fact. Unfortunately this has made promoting the entire profile multiple times more expensive, primarily owing to the fact that each skill has a minimum bid amount of £1, I honestly feel that this may be counter-productive for everyone. 🙂 Yeah, Sounds Great ! Thanks pph, feel glad to know this. It will definitely help us to achieve next level of earning ! We need an android PPH app. I really love this opportunity but unfortunately I can’t take this advantage still now cause I have no New payment method like Paypal (Paypal not available in Bangladesh) or Master card etc. There are many terms & condition (like every time need to endorse money with my passport) If I use my Master card outside of my local country. So if PPH also allow My PPH User Account to Featured Profile that might be great for any freelance and they can take this opportunity easily. I believe PPH should be review in this case. Might be nice if you could start weeding out the job posters offering $5 an hour including research time. Or simply set a minimum rate. Some of these job posters are an insult. Another way to get people to spend more money. Don’t you guys get enough from the commision ? Thank you for your feedback. I will pass this to the relevant team. Good future, but it’s better for me to leave a feedback after a test !